I remember watching the 1961 black and white version of Zero Focus a long time ago thinking, 'this needs an update.' The Hitchcockian premise was very intriguing: a man disappears during his business trip leaving his young wife distressed and confused. She travels to the snow country up north to find the missing husband and digs up someugly past while dead bodies turning up around her. But it was visually bland and lacked any kind of suspense. So it was a nice surprise to see the remake on this year's Japan Cuts line-up. The film is an epic. It begins with stock footage of the destroyed post-war Japan, then seamlessly moves into the economic-boom era of the 50s with impeccable periodic detail. Director Isshin Inudo here crafted a sumptuous picture of the bygone era Japan seldom seen in contemporary films. The year is 1957. 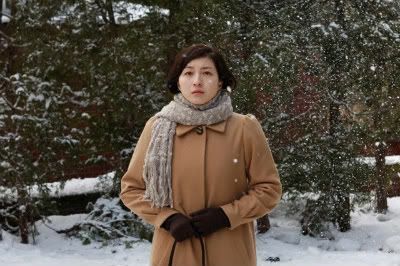 A naïve, young wife Teiko (Ryoko Hirosue)'s search for her missing husband Kenichi (Hidetoshi Nishijima) takes her to Kanazawa, a snow swept beautiful town spared by bombing in WWII (with its dramatic sea cliffs, the town is a ripe setting for the Hitchcock inspired murder mystery). With the help of her husband's colleague from the advertising firm he worked for, she tracks down a client of his, Murota (Takeshi Kaga), a ruthless local businessman and Murota's elegant and sharp-edged wife Sachiko (Miki Nakatani) who is an ardent supporter of a local woman mayoral candidate. If she is elected, she will be the first woman mayor in Japan. But their meetings leave Teiko more questions than answers to her husband's whereabouts. She also encounters Murota's receptionist Hisako (Tae Kimura), whose physical attributes and rough pan-pan girl English (pan-pan girls refer to prostitutes for the occupying GIs) don't really add up to how she landed her job. Kenichi knew these people? Teiko soon realizes she knows nothing about her husband's past. Then the bodies start turning up and she begins to understand that her investigation is a threat to someone. Zero Focus is more than just a murder mystery. It's more to do with however Japan wants to forget the defeat, its shadows haunt the generation from starting anew. Their psyche is forever scarred- Kenichi forever emasculated, Sachiko and Hisako struggling against social, political strictures. The film is also the stage for three-way acting battle by the best actresses in current Japanese cinema -Hirosue (Departures), Nakatani (Memories of Matsuko, Sweet Little Lies) and Kimura (All Around Us). As the film slowly reaches its lengthy climax, there are mental breakdowns, confessions, sacrifices, stabbings, broken glasses, tears and more tears. They act their hearts out in their respective hammy roles. An over-the-top Sirkian melodrama the film turns out to be. But undeniably well done melodrama for sure, as I witnessed many teary eyes at the end of the screening. The film looks back on Japan's painful rebirth from the ashes of WWII and shines a light on people's resilience. Zero Focus is screening on July 15th (9PM) at Japan Society as part of 2010 Japan Cuts.